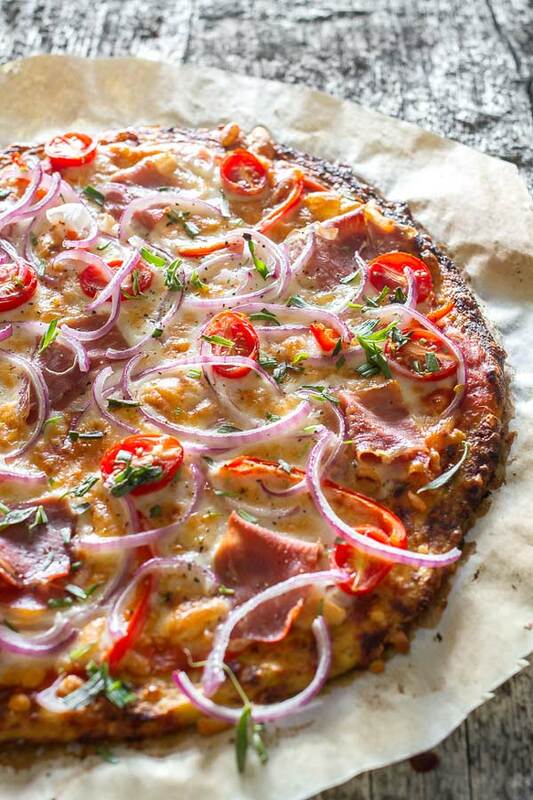 If you enjoyed my cauliflower sticks, then you would love this pizza. Making a flatbread out of cauliflower was a first for me and it turned out to be not bad actually. As you can probably imagine, the idea of making a cauliflower flatbread came from my wife because she has all these weird visions about recipes that people would love in this part of the world. Personally, I don’t care that much for anything besides steaks, potatoes and sandwiches, but I like to keep an open mind. Making a bunch of cheese sticks with cauliflower instead of bread is not such a big stretch, they were actually good, but using it on a pizza, I definitely thought it was a sacrilege, that something will come out from somewhere to smite me. It didn’t happen obviously and since “open minded” is my middle name, here we are with another pizza recipe that really surprised me. As you all know, cauliflower has a specific scent when cooked so if you get past that, once your pizza is ready, you won’t even feel that it doesn’t involve bread. Honestly, it was really good and if you are a health nut then this is definitely for you. If not, then head down to my spicy Italian and enjoy! Preheat oven to 425° F / 220° C. Prepare 1 medium size pizza dish or a large baking sheet with parchment paper. Place the cauliflower in a microwavable container and cover with lid. Microwave for 10 minutes. Place the microwaved cauliflower in a large bowl and add the 2 eggs, 1 cup of mozzarella and salt and pepper. Mix everything together. Shape the mixture into a pizza shape and place it on the parchment paper. Bake it without toppings for 10-15 minutes. Remove from oven and sprinkle 1 cup mozzarella, top with prosciutto, red peppers and tomatoes. put back in the oven and bake for another 5 minutes or until the cheese is melted. When done, sprinkle red onions and fresh tarragon and serve. Eggs are being used to bind the cauliflower so I don’t think you can replace them but if you think of anything that might work, please let me know.